King Edward the Seventh's Galleries. 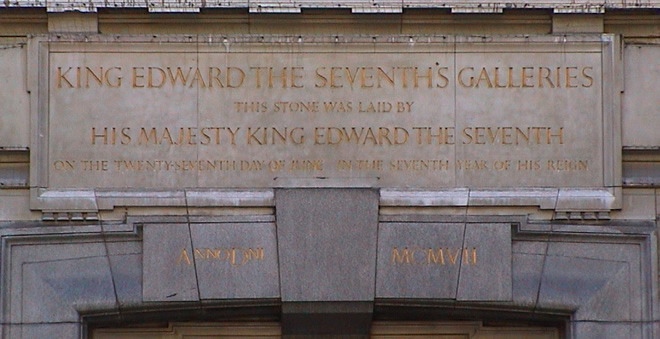 This stone was laid by His Majesty King Edward the Seventh on the twenty-seventh day of June in the seventh year of his reign. So, all the sevens then. Eric Gill designed and carved this memorial. On the arch below the plaque is inscribed 'AnnoDni MCMVII', A.D. 1907. This extension to the British Museum was designed by Sir John James Burnet and completed in 1914. He planned to build two further wings to the east and to the west. An extension to the British Museum by the architect Sir John James Burnett.